December 5, 2016 December 6, 2016 Dr. R. A. In a world engrossed with constant activity possessing peace becomes challenging. From the moment one’s eye open an imaginary list of things to do is presented on a silver platter. The race is on for not letting anything be carried over. Constant movement and rushing from place to place to ensure that everything on the list is scratched off before the day ends. The regular watching of the clock to evaluate time for completing a task further adds tension. Everyone trying to be their own super hero both for self-gratification and the satisfaction of others. Sometimes the pressure to perform can be overwhelming and deplete the reservoir of peace in our hearts. This diminution often leaves us feeling fatigued, empty, abandoned, spent, miserable, downhearted, and downright wanting to throw in the towel. Matters can be further complicated when we feel like we are being left behind, as this produces feelings of bereft, abandonment, loneliness, anxiety, fear and hopelessness. What to do? Where to turn? Who can help in alleviating the stress? You think you are the only one in this situation, but that is not true. In the book of John, the disciples found themselves in somewhat of a similar predicament where they had to evangelize the world and if that was not pressuring enough they were now being advised by their leader that he will be leaving them. One can only imagine the panic that took place in their mind as they tried to process what was being said. They must have wondered how on earth they were going to accomplish such a task with the rug being pulled from under their feet. An assessment of their environment showed that they were not the most loved and accepted. After all, what they represented was against society’s status quo. What will we do? Where will we go? Who will help us? These questions highlighted their minds as they would no longer have a crutch to support. However, their leader spoke resounding tranquility in their hearts. Yes, I will be leaving you to accomplish a great task but I am leaving you with a gift. “I leave you the gift of peace of mind and hearts.The peace I give the world cannot give, so don’t be troubled or afraid.” He was basically, saying you have no need to panic or be alarmed because when I leave the comforter will come and because He will reside on the inside of you, there will be greater within you that whatever it is that you will be faced with. The same promise has been passed on to every believer, the God of peace, whose peace surpasses all understanding is on the inside of us. He gave us the gift of peace in our hearts and minds which means, He resides in our hearts and minds so we need not become discombobulated. He is the Creator of the universe, Who has and is orchestrating all things as it pertains to us. We are in His hands and He is constantly watching over us. He is our protector, provider and just about anything we could have need of. He is the great I AM, that which we have need of and more. Rest in His peace because there is nothing that will ever happen to us that takes Him by surprise. He is in control. He is Sovereign! He will never leave of forsake us! Let His peace saturate your emotions and your intellect. The peace that the world offer can only partially satisfy one component of us at a time. 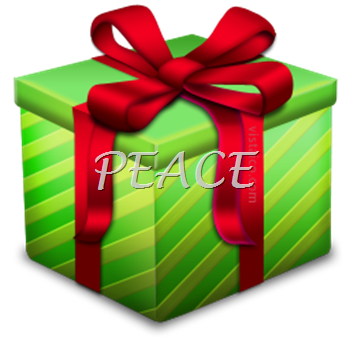 But God’s gift peace satiates every part of our being at the same time. Again I say, don’t let life’s circumstances causes you to become distraught or upset, instead, let His gift of peace saturate your emotions and intellect.